Suspicious Heuristics: Are economics blogs entering mainstream news? For an unrelated project I'm working on, I wrote some scripts which allow easy text searching and analysis of LexisNexis articles. As the tools were already there, I decided to check up on how economics bloggers, particularly those who happen to be GMU economists, are faring in mainstream news coverage. The results weren't very pretty. Procedure: I downloaded about 2,000 articles from the last month's major world publications which mention the words "economics" and "professor" (just to give them a fighting chance) somewhere in the text. A few Python scripts later, I have these cleaned, in a csv, and then STATA-readable format and can construct statistics for how often various words occur in each article. 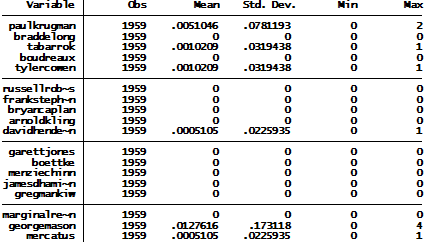 This table summarizes the results. "Max" shows the most number of times each is mentioned in an article, "mean" the average number of times. Don Boudreaux and Russell Roberts run Cafe Hayek, a well-reputed blog in many circles, but are not even mentioned once in the last month. Alex Tabarrok and Tyler Cowen write for the famous blog Marginal Revolution, and are each mentioned just once. None of the Econlog bloggers appear, except David Henderson is mentioned once. Maybe this is because my list contains lots of libertarian-ish bloggers, so I include a few Keynesians for balance. Brad DeLong is never mentioned. Paul Krugman appears a total of four times, twice in one article, so there must be at least three articles this month which feature his name. I'm happy to report that Mercatus is able to tie Krugman, so not all hope is lost... And George Mason appears more often than all the others combined, a home run in my book. So, while the social media revolution may be sweeping other parts of journalism, it appears from these numbers that the economics blogosphere remains fairly isolated from mainstream media. Then again, publications like All Africa and the South China Morning Post may just not care that much about the econ-celebrities of the United States.